As you might have noticed, I don’t post at the frequency I was used to when I started this blog. I don’t think I had what is called “the writers block”, but the lack of ideas to write about was an important factor. Sometimes you think that you are out of ideas to post on the blog, but there are a lot of things to write about in your topic, but there is something more, like a block. I read a lot of articles about writers block and got a lot of advice. Everything worked only once. For something to work, it must be simple. Today someone told me about a tool that would overcome writer’s blog and generate blog post ideas. At first, I was thinking that it is another website that probably won’t work, but when I tried it, many ideas of blog posts to write about came into my mind. And you only have to click one button. The tool will not give you ideas on what to write about, nor advice. This tool will suggest you how to start the title of a blog post. Once I saw first few suggestions, a lot of things to write about come into my head. The tools is putting your mind to work. 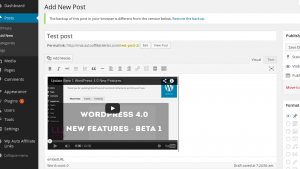 WordPress 4.0 has just launched today, with new post, media and plugin management interface improvements. Why I am really excited about this is that a lot of people I know complained about the WordPress post editor because it was not real wysiwyg or because it is hard to embed videos or other media. For someone who is making a full time income by writing, this is very important. Switching from visual to text editor and back many times so you can embed a video is frustrating. In the latest WordPress release, you can embed youtube videos, tweets or other embedable media only by inserting the link into the visual editor. More, you can play the video directly from the editor. Also, now the content textarea will expand as your content grows, so you won’t have to scroll inside, letting you focus more on your content. 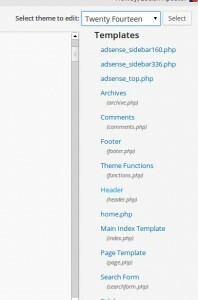 Another area where WordPress was criticized is the plugin manager from WordPress. In WordPress 4.0, there is a new plugin management interface where all the information about the plugins, including reviews is available. Media library manager was also improved. Video and image management is now much easier with the new AJAX interface. If you are in Internet Marketing for some time, you know that you can make more money from your website with affiliate links rather than displaying ads. Ads are very easy to set-up, you just place the ad codes in hot areas of your site and then you just keep checking the earnings. Placing affiliate links is also easy, but you have to go to the merchant site, find products to promote related to your content, add the links, then make sure that the links are still working, remove broken links, update links, etc. What if I told you there is an automated way to do all this ? 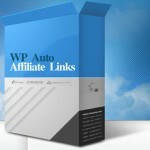 Wp Auto Affilate Links PRO automatically connect to Facebook and Clickbank, get the links relevant to your content, and place them into your content. The links will be placed on product references, product categories, hot phrases, etc. Easier than setting up ad units. You only set your affiliate id, your website category, how many links you want to be displayed and you are done. The plugin also has a manual functionality, where you can get your own links and set which keywords ( or keyphrases ) you want them to be displayed on. So, what are you waiting for ? You can install the plugin directly from your administration panel. Go to “Plugins” -> Add new and search for “auto affiliate links”. Getting money our of your blog is not as easy as it was several years ago. Yes, you can give out sponsored reviews or sell directly ad space on your blog, but this can happen only if you are a popular blogger, or if you are covering a very specific topic or a small niche. For a more general blog things can get complicated. Until you come to the point where you can maintain your own tutoring membership program, or to give online consultation for 100$/hour, you have to get used to earn some revenue to keep going. Google Adsense used to be a good income stream for bloggers, but today, the CTR is low because people used to ignore google ads, and CPC is also at a very low level. On the other hand Amazon affiliate system ( Amazon associates ), can be a good alternative, but only in certain situations, usually when you can find high ticket items to sell. Unlike any other affiliate program around, Amazon associates give probably the lowest rate in the industry, and there is no cookie stored.If they buy in the session after they click on a link on your website you get paid. If they leave and come back later you won’t. So, unless they put something into the cart the session they click on your affiliate link you don’t get any commission. The average conversion rate on amazon ( the number of purchases for every 100 users you send to amazon ), is 1%. For every 100 clicks you usually get 1 sale. Depending on the links you have on your website, you might need 1000-3000 pageviews to get 100 clicks to amazon. If you sell $10 ebooks, where you get 40 cents for each or 60 cents if you generate them enough sales every month, your EPM ( earnings per mile impressions ), can be at 0.40$ top, and can go as low as 0.10$. If you sell a 500$ laptop, the conversion rate might be lower, but you can make a good 20$ per sale. This time, your EPM can start from 5$ and can go anywhere up to 20$. If you show only adsense ads, unless your website covers a high paying topic, you will make between 1$ and 5$. If you put a lot of ads all over your website and you are in the right niche, you might get up to $10 for every 1000 impressions. The figures are not that high either. My conclusion: If you are selling high ticket items, go for Amazon. If not, go for Google Adsense. 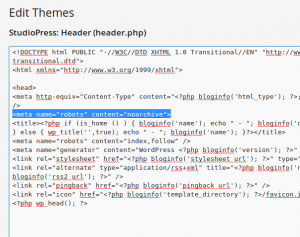 In wordpress, with plugins you can accomplish everything. But how it will be to have few hundred plugins installed ? 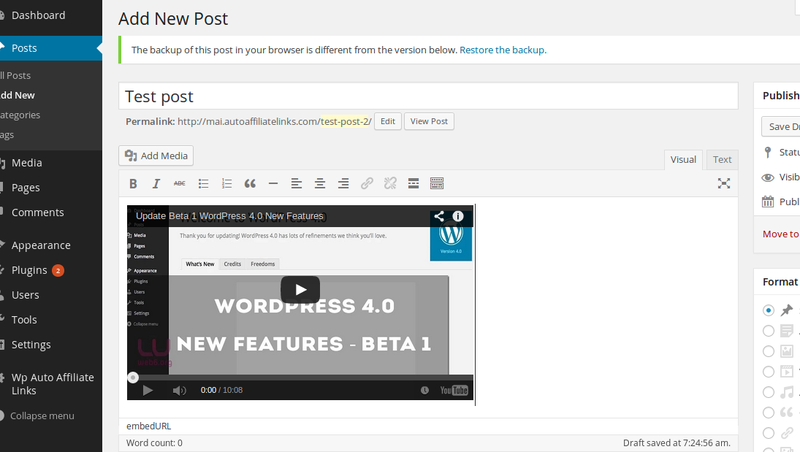 WordPress plugins are updated frequently, this means that you will have to update a plugin almost every day. How about security problems that might appear due to bad coding of the plugins ? If you just use few important plugins you will be safer and your wordpress experience will be better. 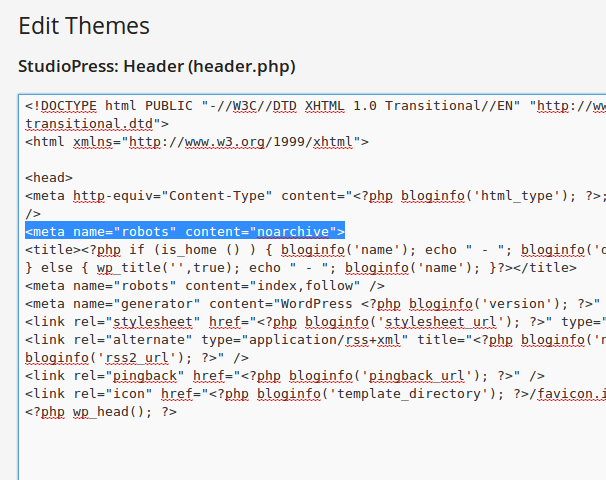 There are many things in wordpress that can be done by writing a line of code using the theme editor from your administration panel ( I know you hate ftp clients ). What is search engine archiving ? You can use meta tags placed into document head to give instructions to search engines. While this is not a way to stop your website being archived by crappy search engines or bad people, big search engines will always follow instructions. For example, Google shows visitors cached versions of your page, mostly when your website is unavailable or when someone request a cached copy. If you should place a “noarchive” tag into your head section of your page depends on what page it is. If if is a static page, or a blog post, there is no need for you to block search engines from caching your site. But, if you sell products or services on your page then it might be a good idea to prevent caching. Your future customers might access cached versions of the page where you offered another price or to disclose your marketing and pricing strategies. Also, if there is a page that is updated too often, it might be also good to prevent caching because the information in the cache is outdated and irrelevant. In wordpress, go to “Appearance” -> “Editor”. 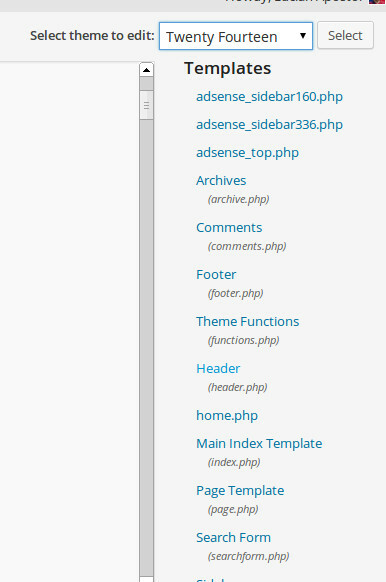 On that page, you will see your template files listed on the right side. Select “Header”. Make sure to put your code between opening and closing head tags, as it is shown in the images below. Blogging can be an easy way to make some money online by sharing your knowledge. You don’t need any programming, designing, or tech skills to get started. You need to have some experience and be passionate about a subject. You start writing articles, tips, tricks, insights, your own experiences, share the posts with all your friends interested in the subject and traffic will come someday. Then, the easiest way to monetize this content is to place some ads around. When the blog audience grow, the revenue streams can be many, but for starters, contextual advertising might be the single option. At least for those who think they are not prepared to get into affiliate marketing, or who do not find good products to promote. Google Adsense is the highest paying contextual ad network. Some topics and niches can get better results from other networks, but they are only particular cases. Most website will generate bigger revenues from Google Adsense ads. That’s because they have by far the most advertisers who are already used to pay big bucks for search engine traffic. Despite this fact, bloggers ( including me ), always complained about poor revenue coming from ads, compared to other sites. The metric to define the display ad performance is RPM ( Revenue per thousand impressions. I think it was used to be called EPM before. Depending a lot on the topic, the type of people that visit the website, websites usually get between $1 and $10 RPM. However, blogs are always in the low part of the graph, most of blogs failing to reach even 1 dollar for every thousand impressions. It is true that since more and more websites were added in the program, the revenue started to drop constantly. But even when the average adsense payment was high, blogs usually did 3-4 times worse than other websites. For example if a normal website have $5 EPM, a blog usually had $1-2 EPM. Why is happening ? When readers come to a blog, they are so focused on reading the article. They focus on the text and completely ignore ads and everything else. An important factor why they have a easy job doing this is because most blogs look alike: content on one hand, sidebar on the other. On a normal website, they need some time figuring what on the website is what they are looking for so there is a bigger chance they will stick to an ad. So, is Adsense dead for bloggers ? Is still worth it ? If you just want to place one ad in the header, one in the sidebar and one after the article, then you might forget about it. You need so many visitors to make real money that it is not worth. If you manage to get 100,000 page views a month, then you must be doing a really good job. Why you should waste all your time for a $100 dollar check every month ? You will either find other ways to make money from your traffic or you will stop blogging. Last year I had the same problem. I had a blog who got a lot of traffic, mainly by mistake. I had a domain name that was exact keyword match for a popular movie. It was a subject that I had no interest in. Someone helped me and wrote few articles and then traffic started to come, in waves. Then, I was mad because I was making so few money from Google Adsense. At that point I thought what can I do to put an ad somewhere where the readers simply cannot ignore. And it struck me: in the middle of the content. I did some wordpress coding and I had an adsense ad displayed after the second paragraph of the content. Result ? The Adsense revenue on that ad was 8 times bigger than any other ad on my page. Then I removed all other ads and left only this one. The revenue was 5 times bigger with only 1 ad, than it was with 3 ads before. That’s a big increase. So I managed to get some good money from the traffic that I had no idea how to keep oo monetize. Then, I build a plugin based on this technique, that I called Revenue Maximizer. Will let any wordpress user to add an adsense ad, or any other offer ( affiliate link, banner ), right in the iddle of the content, where the reader cannot ignore. 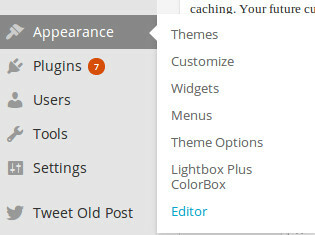 The plugin is freely available on wordpress plugin directory. Keeping up to date with technology is important for any type of business. This will help the business thrive and keep in competition with the rest of its competitors. One of the ways that you can begin to use modern technology for your business is networking. You can find out more about network solutions by reading information regarding networking topics. Rest assured that you will be able to find a wide range of alternatives that can get the name of your business out in the virtual world. Social media is one of the most important parts to networking on the Internet. This outlet can help to spread the name of your business across the world. Rest assured that you will notice the difference in customer traffic within a couple of weeks. Experts who specialize in social media marketing will be able to keep track and update news feeds to your social media webpage. By doing this, your customers will have an easier time to keep track of important updates, such as sales or new products, about your business. Other vital parts of networking can include website designs and managing online stores. Designing the website to reflect your business is important. It is also ideal that it creates an appealing view to interested customers. Once you have your website working, you can then concentrate in managing the online store. This will include a checkout process where customers can purchase your products and services. Remember that you make the checkout process fast and easy. Creating networking solutions can create a convenient setup for all of your customers. Within time, you will have customers that will return to your online store to invest in your products or services. It is essential that you keep track of everything that has to do with networking solutions over the Internet. You are certain to get the results that you have always wanted for your business. If you do have any inquiries about these types of online marketing alternatives, you can contact trained professionals, who will be more than happy to answer all of your questions, by phone.